Dr. Reeves is presented with the donation from the FFA chapter members of Charlotte High School. Rachel, FFA member, signs the check. 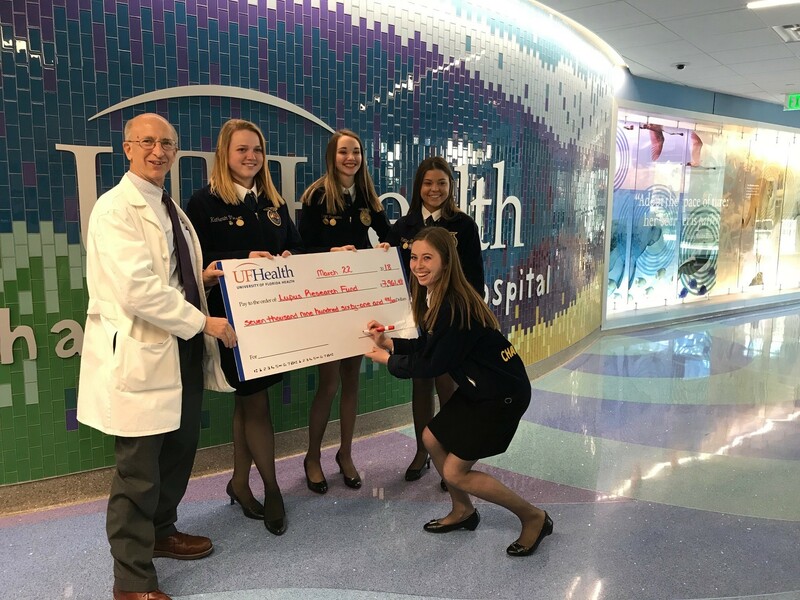 The Future Farmers of America (FFA) chapter from Charlotte High School in Punta Gorda, Fla. has donated $7,961.48 toward lupus research in the University of Florida’s Division of Rheumatology and Clinical Immunology. Rachel, a Charlotte High School student and FFA member, was diagnosed with system lupus erythematosus (SLE). Following her diagnosis, Rachel’s mother Kim was searching for institutions that were actively conducting lupus research and found Dr. Westley Reeves in the UF Division of Rheumatology. The FFA chapter organized the “Farming For A Cure For Lupus” 5k run that raised almost $8,000 from FFA students and alumni. Rachel and her friends from the chapter drove to Gainesville to deliver the check, and also got to spend time with Dr. Reeves and Dr. Hoayang learning more about the division’s research, as well as getting a tour of the hospital.